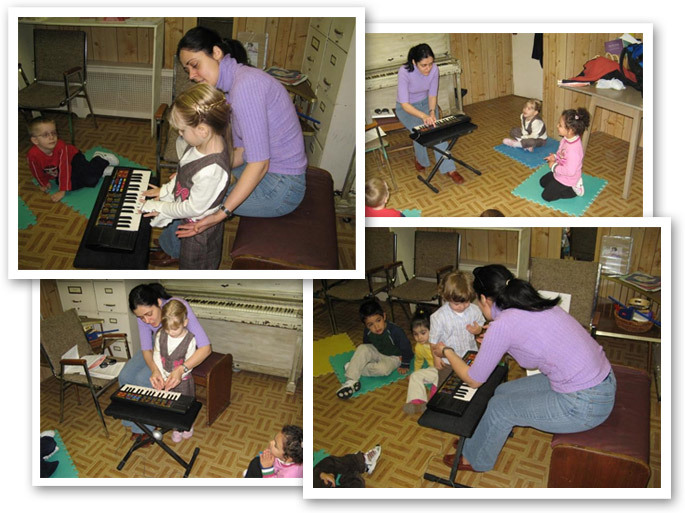 Music lessons are prepared by the professional music teacher. Music plays very a important role in the children lives. When the child grows with the music, it helps him develop the mathematical mind, concentration, attention and very important relaxation. We offer group and private lessons with the professional teacher. The purpose of childhood music education is to expose children to music at an early age, giving them the opportunity of enjoying it and accepting it as an integral part of their lives. As an universal means of communication (learning to read music is like learning to read a language of the earth), music can express a highly diversified and virtually unlimited variety of human expression, bridging the gap to the other arts, such as dance and drama. Teaching music through enjoyable, interactive and flexible music games, in a totally non-competitive environment, where children work together being supportive of each other rather than competitive. Developing of a musical ear in order to recognize the differences in pitch of the tones in the scales. This is one of few art activities, where child is so close to nature that he/she can actually feel it, work with it and has a real 'hands-on' experience. 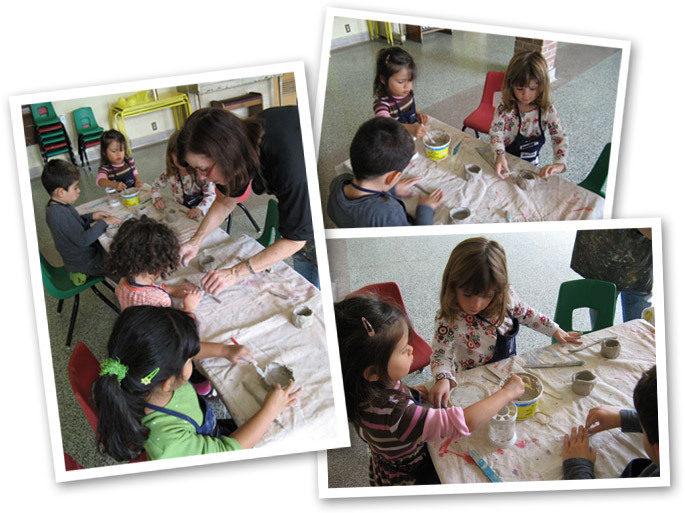 The pottery is three dimensional activity and it also forces children to think about structure, shapes and forms. Clay is a fantastic material and children love the experience of working with their hands in "mud" and they enjoy creating the things. Children are involved in very fun creation of shapes and forms from wet clay. These prints and forms, providing lasting memories and becoming cherished keepsakes. Field trips are planned for each new school year by the teachers. Usually we do 2 or 3 field trips during the year. We always have a great time on the farm, in the theatre or on the nature walk at the park. Children learn a lot about animals, how to behave themselves as well as how to keep the nature clean and protected. Children have natural ability to express themselves in a physical way. Dance classes are the perfect way to help toddlers and preschoolers develop that gift and learn to freely explore their unlimited imaginations. The aim is to encourage the joys of dance and music in children. The focus is to nurture each child's individual dance interpretation, promoting strong self-esteem. We offer a variety of dance styles: Classic and New Hip Hop, Breakdance, Bollywood, Pop Song & Dance, African-Caribbean, and Salsa. 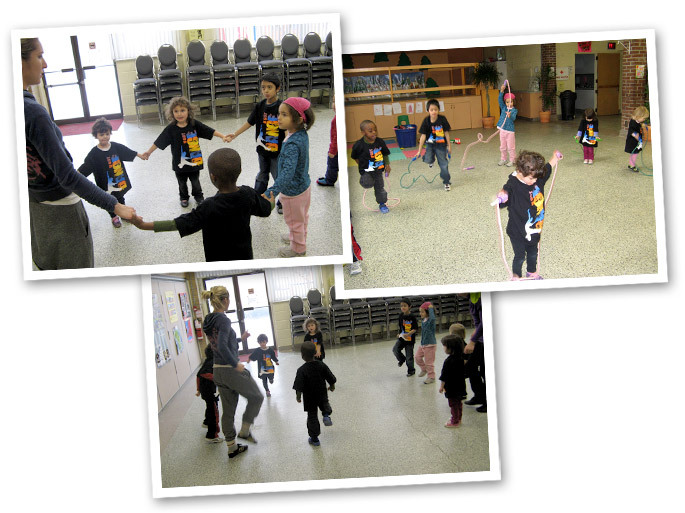 The classes are a fun way of introducing child to the concept of dancing. They teach children body awareness, co-ordination, rhythm and basic dance moves. The course is packed with fun activities and dances to music related to this age group. The classes always start with a fitness warm-up featuring aerobics, muscle strengthening exercises and light stretching. The warm-up is followed by training the individual moves beginning with simple steps to help establish balance, increase flexibility, improve rhythm, and build coordination, and then progressing to more advanced steps. Children will benefit from creative expression during their childhood.